"Jacksonville, Florida. 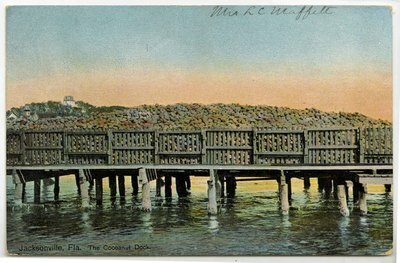 The Coconut Dock. 1900-1930"
On the Back. Original spelled as cocoanut: Jacksonville, Florida. The Cocoanut Dock. Many years ago the Spanish brig "Providencia" cocoanut-laden was cast away off the Florida coast and the cocoanuts were washed ashore to find congenial climate and soil for reproductive growth. Today the nuts form a considerable item of export through the port of Jacksonville. The cocoanut wharf is one of the sights of the city.